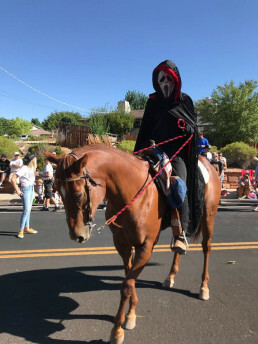 The last week in October, the Walter family sponsored a haunted forest fundraiser event for the Snow Canyon High School Drill Team and Wyatt Craven, Michelle Walter’s five year old nephew, who was diagnosed with leukemia in April. The joint fundraiser was held at the six-acre Walter family farm in Santa Clara, Utah, and was supported by more than 80 volunteers. 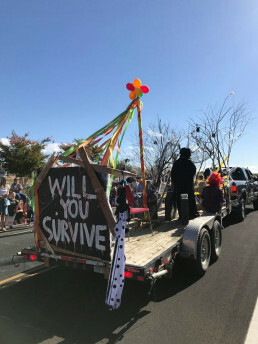 Volunteers helped in many capacities by donating props, creating scenes, staffing the haunted forest, helping with tech need and disassembling the scenes when the event was over. The haunted forest included a large vortex tunnel, pallet maze, cemetery, a hay room with multiple exit doors and a clown room, complete with a chainsaw wielding clown that chased attendees to the haunted forest exit. ERA Brokers Consolidated sponsored the fundraiser by printing signs and flyers and purchasing 70 tickets for agents and clients that wanted to attend the event.